Isabel Marant is one of my favorite designers, so you would think I'd be eagerly anticipating the reveal of her spring collection. Not so much. The designer's signature romantic, bohemian style has been done to death on the runways this month, so would the the queen of boho reinvent herself, or just be lost among the sea of hippie-dippy shows? 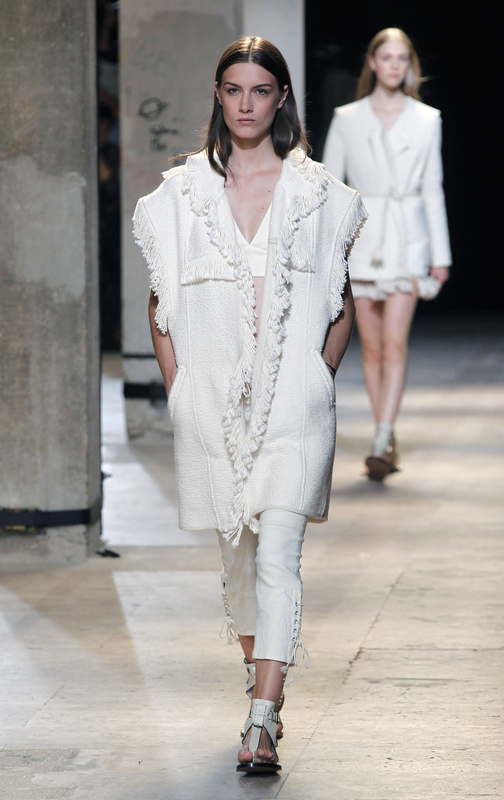 I'm pleased to reveal that she's done it — according to Isabel Marant, boho is turning Biblical for spring. Grab your robes and rope belts. Marant, who sent her girls down the runway in a sandstorm of fringed tunics, rope-belted draped dresses, earth toned colors, and low-rise pants, was inspired by tribes in Africa. She took her collection artisanal, mixing raw textures, fringe, and even some puka shells. Marant kept the silhouettes clean, structured, and, yes, short — to infuse a little sinful sweetness into the garments. And she had an interesting take on the gladiator sandal as well, making the famous accessory a little less Russell Crowe and a little more Jesus sandal, which was not that much of a surprise considering her resort collection featured Birkenstocks. Looks like comfort is here to stay for at least one more season. The clean lines and structured separates were a surprise from the designer, but I must confess, it was a pleasant one. While other designers go bohemian chic, Marant created a new niche for herself, showing that boho was cool way before the '70s, and I can't wait to try the look come spring. Now, where can I buy my ticket for the ark?